A fton, NY (WBNG Binghamton) New technology is proving useful to high school students with serious medical needs. A computerized robot took the place of one Afton senior while she recovered from surgery. Shanalin Heath hasn't stepped foot inside Afton Central School for more than a month. She had facial reconstruction surgery in April, but thanks to a robot called "VGo" she hasn't missed a thing. "Honestly, my first time seeing it (the VGo) was yesterday, I never got to see it in person before," Heath said. "I didn't realize it was that small, because when I first started driving it I didn't know my areas when I was going through a doorway." The robot literally attended class while Shanalin was at home recovering. Shanalin's friends say she's been in school all along. "I just think it's really cool," said junior Payton Cutting. "I would move the chair for her so she could still sit next to me in class." VGo helped keep Shanalin up to date on all her school work, but it also gave her a way to keep in touch with all her classmates during the final few months of her senior year. "The student could stand right in front of the VGo and have a conversation with her, a face-to-face conversation, so I think it gives the student at home a sense of belonging." VGo picked up the nickname "Shan-Droid" during its stay at Afton. Students will always remember the time they had class with a robot. "We're a small school, so you would never expect that we would get a robot," said junior Christian Cabrera. "That would, like roam through the halls with us." 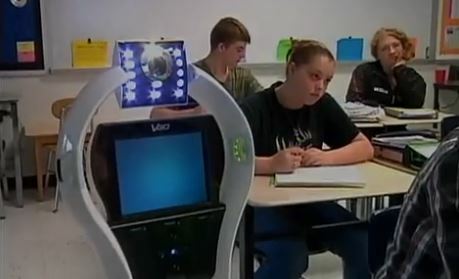 Afton Central School acquired the robot through DCMO BOCES' distance learning program. VGo's next stop is Bainbridge High School to help another student.